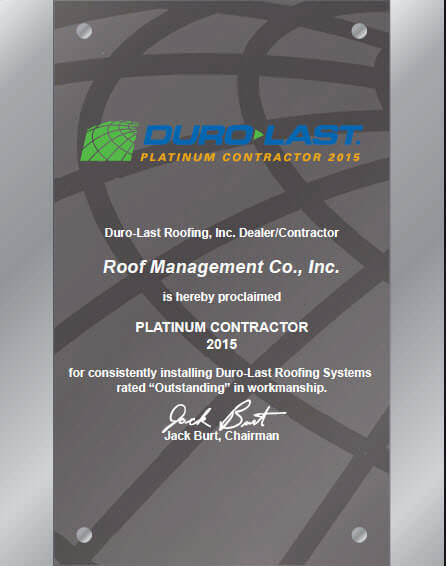 ROOF Management CO was awarded the Duro-Last Platinum Contractor Award 2015. What an amazing achievement. We don’t want to toot our own horn, but then again that’s the point of writing about it. Our work is honored by the people who supply the “World’s Best Roof ®”. Duro-Last makes a great product. However, it doesn’t install itself. That’s where we come in. Our installation team is highly trained and ready to install your commercial roof. We strive to be the best commercial roofing contractors in Michigan. Commercial roofing companies in Michigan are certainly plentiful. We hope this prestigious award will help you choose us.